The major trend is down, the intermediate trend is sideways and the near-term trend is up. I am focusing on the near-term trend (last three weeks) in this analysis. The near-term trend is up and the resistance zone is identified on the above chart. 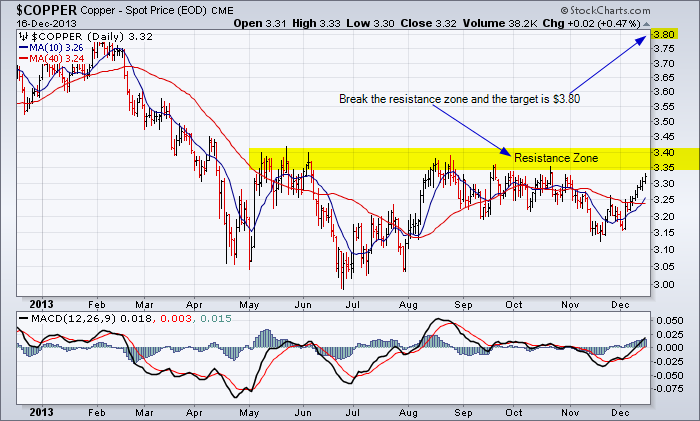 A break above the resistance zone would indicate a target of $3.80. The price of copper is a good proxy for the growth in the world economy:in particular for China. A breakout above the resistance zone would bode well for the TSX Index which has a relatively large weighting in base metal stocks. A failure for copper to breakout above the resistance zone would indicate that the TSX Index will not breakout above the 13,500 resistance level. This entry was posted in Other Topics and tagged bar chart, copper, intermediate trend, major trend, near-term trend, resistance on December 16, 2013 by Trader.